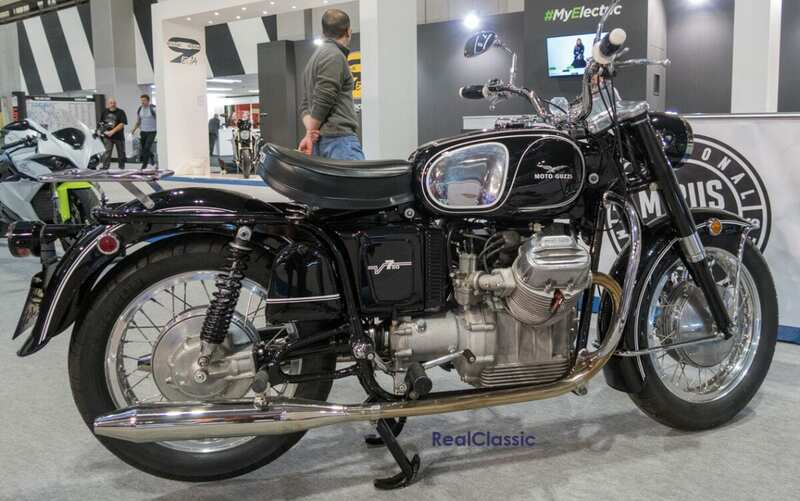 I was wandering out of the NEC one evening after a hard days graft at Motorcycle Live when I spied, in the distance, what I thought to be a BMW of classic appearance. 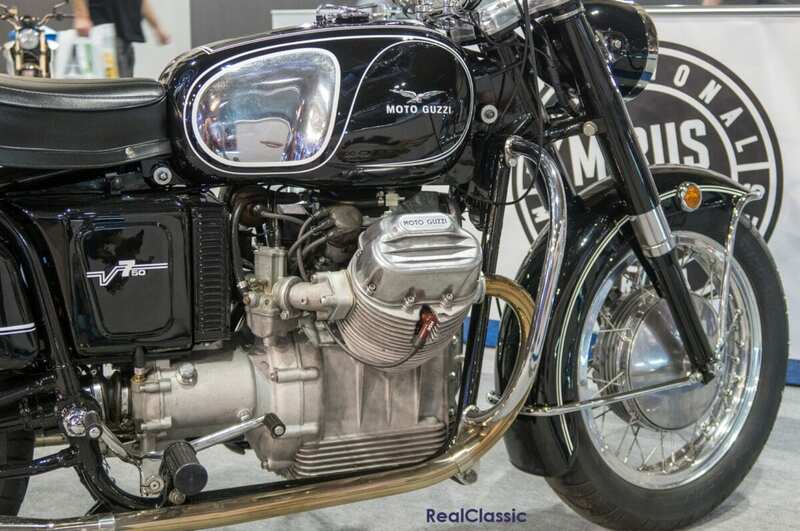 A closer look revealed something just as interesting but of an Italian rather than German origin – a Moto Guzzi V7 Special. This one dates from 1968 and is a handsome machine in its black livery, set off by the chrome indent on the tank. Of course I had to take some photos for the album despite the fact the show was closing and a train awaited to get me back to Jones Towers. I hope you feel it was worth the effort. 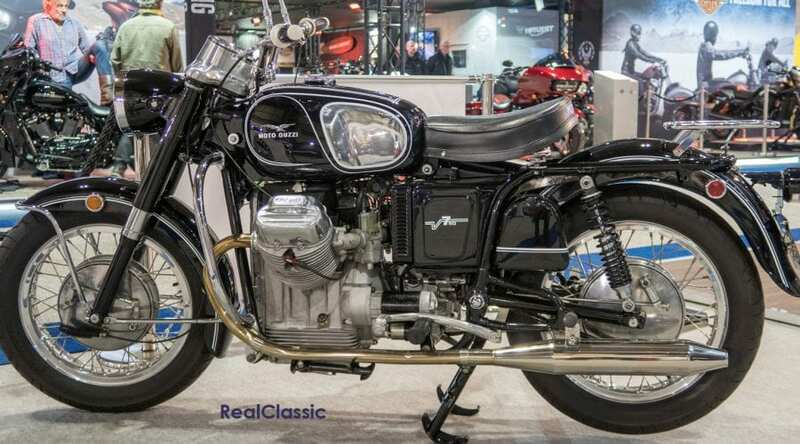 The first 704cc V7 appeared at the Milan show in 1965 where it was the star, but its origins were rather more prosaic, rooted in the marque’s desire to secure the contract to supply motorcycles to the Italian police and military. 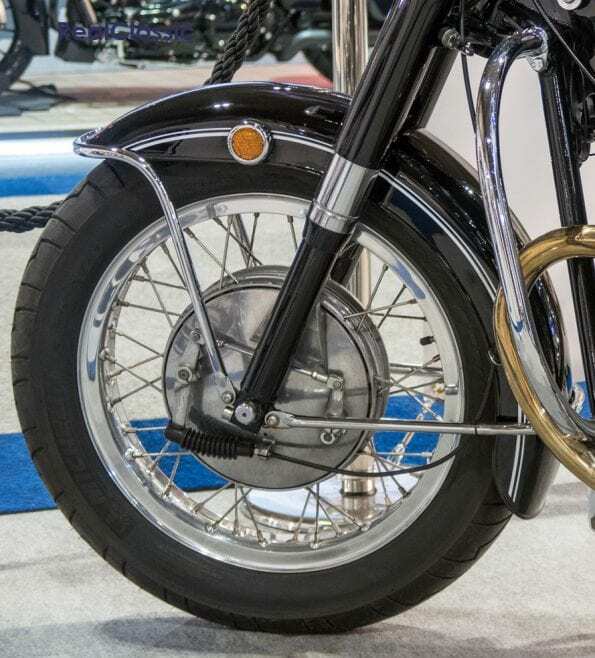 Regular production only started in 1967 and the press were impressed with its design and an unusual level of quiet and sophistication for a bike of this period. 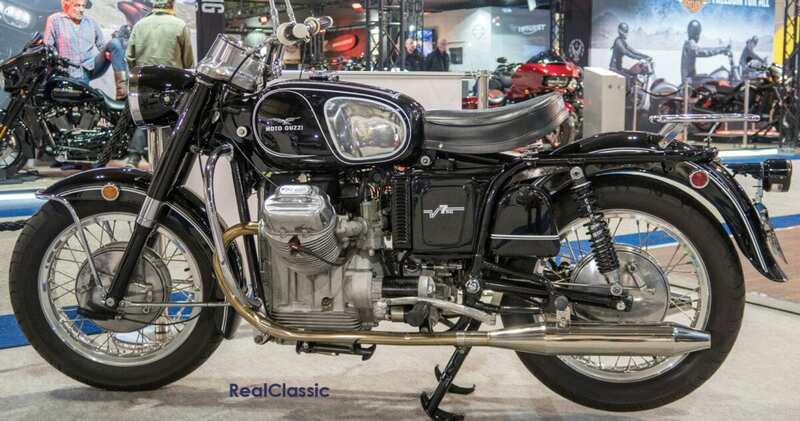 When Lino Tonti joined Guzzi in the latter part of the 1960s he continued work on the V7. 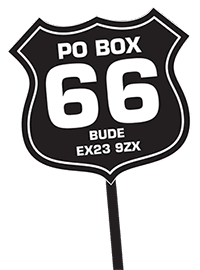 To satisfy the key US market and its desire for cubes, the engine bore was increased to 757cc. In the US it was marketed as the Ambassador whilst in Europe it was known as the Special. Other changes for the US included a lengthened frame and a larger fuel tank, and the larger capacity machines opened the door to the US police where several fleets used the V-twin. The four-speed gearbox had a right hand shift for Europe but the Ambassador had its gear change moved over to the left hand side. Top speed was said to be about 115mph and acceleration was impressive too; Cycle magazine managed a 14.36s quarter mile in 1969 at 93.16mph, just as fast as a lighter British 650. 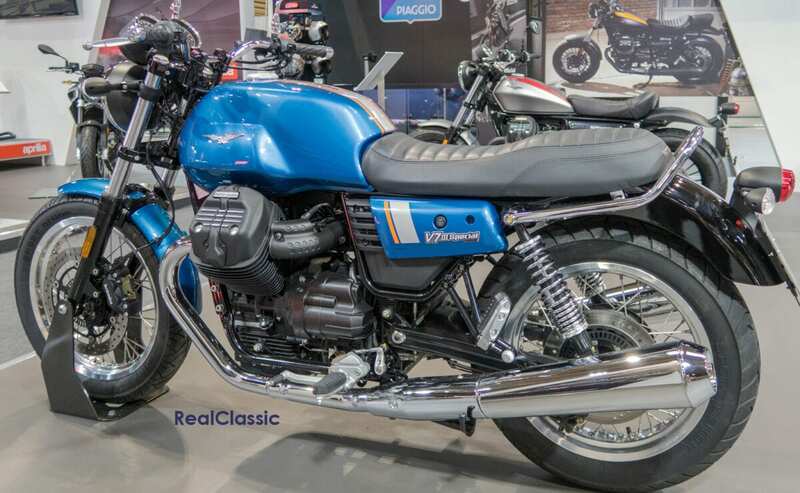 You have only to look at the 2017 V7 III Special on Moto Guzzi’s stand at the NEC to see where its styling influences come from. 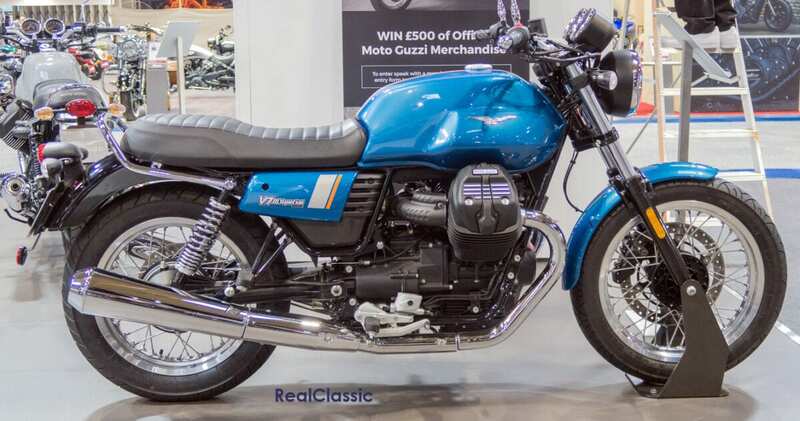 This model has been produced to celebrate the 50th anniversary of the V7 and, although it has all the technological doo-dads that are required for a modern motorcycle, it has retained much of the original appearance and character of the original V7. You can buy a new V7 for about £8700 – less than you’d pay for an original 1968 versions, but I know which one I’d rather have in the garage. I mean, disc brakes may be more efficient but are never attractive as those big drums.